An outside view of the home. 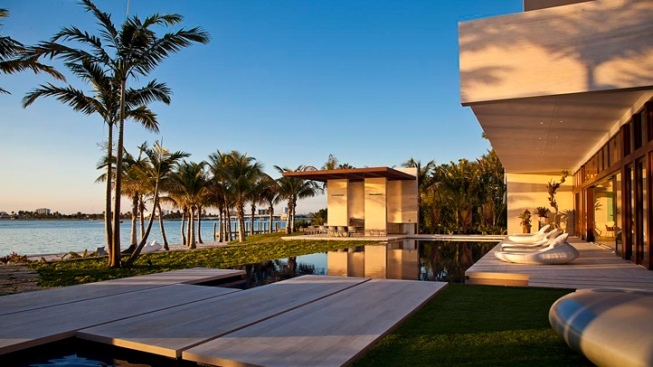 A home on the private island Indian Creek has sold for $47 million and the real estate agents say it was the most expensive sale in Miami's history. The 10 bedroom, 14 bathroom home is 30,000 square feet with waterfront views from every single room, the real estate agents known as The Jills said in a statement. There is a 100-foot pool and cabana, six wet bars, a rooftop sky bar and a jacuzzi. The homeowners can also exercise in the glass encased waterfront gym. Indian Creek overlooks Biscayne Bay and is a 300-acre island with 32 homes and an exclusive 18-hole golf course and country club. "This sale sets the new standard for the Miami Beach luxury market. It is easily one of the most spectacular properties in the world. I am blown away every time I walk through the door,” said real estate agent Jill Eber. “This property is a private resort that is a true work of art." The people who had owned and built the property wanted to create a home that "reflected the South Florida lifestyle, including a resort beach, spa, 3-D theater, vertical garden," the statement said. There are also limestone walls and indoor reflecting pools. “Three Indian Creek awakened the market due to its unique design and form. It’s a magnificent blend of glass, water and sunlight that skillfully brings the outside into the home in a peaceful zen-like architectural wonder,” Jill Hertzberg said.